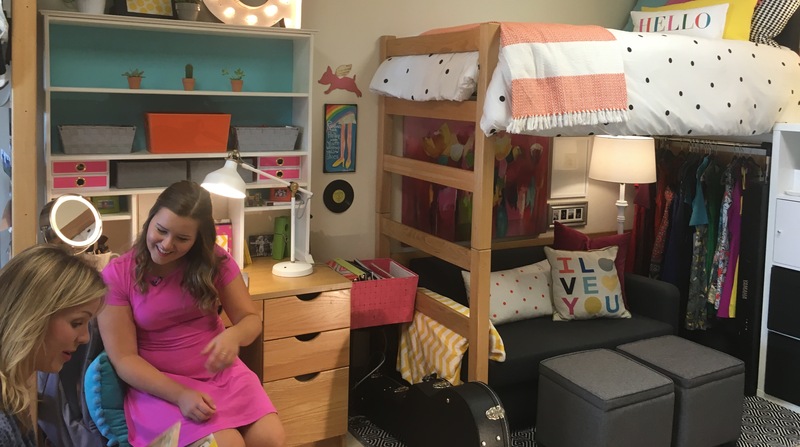 Gracie Schram, a freshman from Kansas City, was recently interviewed by WKRN’s Samantha Fisher for her creatively decorated dorm room and coordinating music career. A singer-songwriter and all around social media enthusiast, Schram has a youtube channel that promotes her music and after moving to Belmont, her stylish dorm room. Prominently featured on the shelves above her wardrobe, Schram has many pairs of yellow shoes–a choice specifically made to link her style to her music. The first single from her premiere album is titled, “Yellow Shoes” and gives a nod to Schram’s colorful personality–the same style seen in her room. Schram’s “humble abode,” as she calls it, is more than the place she sleeps each night. Looking towards the future, she hopes to continue building her career in that room as she takes classes at Belmont and furthers her education. Giving credit for her already found success as an artist to her social media involvement, Schram said her more than 30,000 viewers find her in a variety of ways and are always interested in following along. For more information on Gracie Schram and her musical career, click here.